My wife and I have lived in Maricopa, AZ for a little over 3 years now. Maricopa is located in the middle of the low Sonoran desert south of Phoenix - some of the hottest and driest areas of Arizona. The land is quite flat and only light desert scrub grows in most of the area. While much of the Sonoran desert is relatively lush, that is not the case in the surrounding areas. The closest areas with decent vegetation and more varied habitat are the Maricopa mountains about 10-15 miles WSW, the Table Top wilderness about 25-30 miles south, the Estrella Mountains about 15-25 miles WNW, and a variety of washes that are dry for 10 or 11 months of the year (including the Santa Rosa wash that meanders through the town but only has sparse Palo Verde and shrubs). Southern Arizona is known for its diverse wildlife, but most of that diversity comes from the "sky islands" - scattered mountain ranges reaching to 9000' providing sanctuaries and diverse habitat. Maricopa, on the other hand, is located in the middle of a dry, baron land that doesn't provide much shade, water, or cover for wildlife. 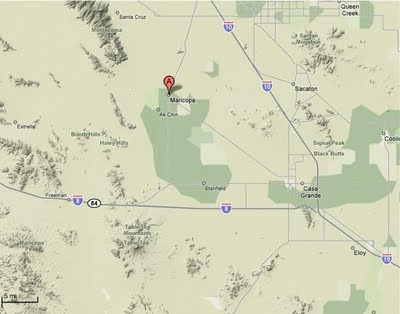 However, Maricopa's location may actually provide a lot of potential for bird life in the future, however. The town is by and large a new city, having really sprung up during the housing boom in the 2004-2007 era. Prior to that, it was a small agricultural community with just a few hundred residences. Now the population is thought to exceed 30,000. How is this good for wildlife, and more specifically bird life? Well, it may not be good for year-round low desert inhabitants such as snakes, the Sonoran Desert Toad, and other hearty species. But Maricopa's location may provide an "oasis" affect for migratory birds. With homes comes diverse vegetation, bird baths, water fountains, irrigation, and man-made lakes and ponds. As time progresses all of the new/immature landscaping planted in the last few years will begin to grow and provide improved habitat. In my own back yard our maturing landscaping is continually resulting in new bird arrivals. Orioles are becoming more common, migrants not previously seen are showing up fairly regularly, and more desert regulars are showing up. 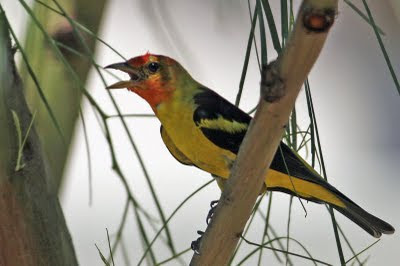 Below is one example of a migrant - a Western Tanager that has shown up twice in the last two weeks. Our yard has attracted 5 warbler species including the Yellow-Breasted Chat, 5 hummingbird species, 2 oriole species, and lesser goldfinch (which take up residence for 9 months of the year) - in all 37 species of birds. That number expands to 45 when including sitings are ponds within town. While 37 (or even 45) is not a lot compared to the potential, this is not bad considering such low desert staples as Gila Woodpecker, Curve-Billed Thrasher, Cactus Wren, and Northern Mockingbird have yet to make an appearance.